Boxes. Flat, unused boxes laying in storage since the industry crashed. In the world of video game collecting, they count as gold. Charles Band is an easy going, 61-year old veteran carrying a name synonymous with the VHS heyday of the 1980s and ’90s. Titles like Puppet Master and The Ghoulies ring true to B horror movie fans. 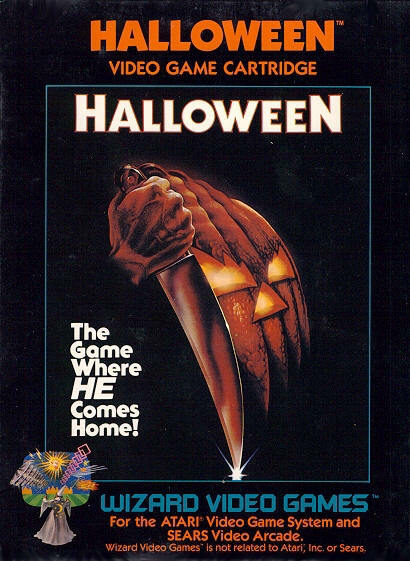 In the early days of home video, when according to Band people thought he was “crazy for licensing films,” he managed to gain rights to two horror properties for video game distribution: Texas Chainsaw Massacre and Halloween. The titles carry a mystique today. Stores would not stock them, or held them behind the counter. 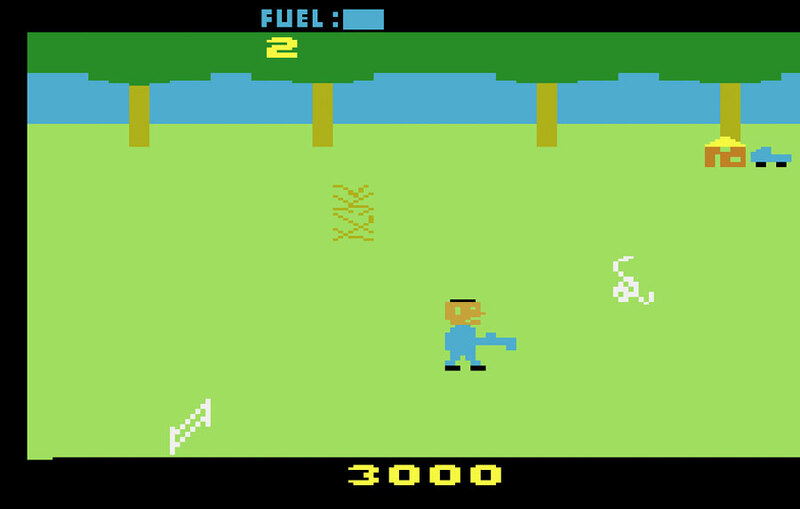 Supposed controversy swelled up as parents were appalled at the sight of minimalistic, Atari 2600 level decapitations. All of this has caused values to rise, with Texas Chainsaw Massacre commanding upwards of $150, and Halloween pushing well over $200 on today’s ever burgeoning collector’s market. Digging through a Los Angeles warehouse filled with artifacts of Wizard and Full Moon Video brands, Band recently uncovered a slew of new, untouched big box VHS covers. Those were literal giants of the rental industry, often twice the size of a standard VHS box. In another corner, Band found something even more special. Never stocked, flat boxes for Texas Chainsaw and Halloween on the Atari 2600. He estimates around 100 of each are pristine despite being shuffled around for decades. Others, unfortunately, were lost to water damage. Of course, Band never considered these would be worth something, so off to storage they went when the business venture collapsed. Now, it is a different story, and their value allows him to look back on one of the stranger efforts of his career. Picture the late 1970s or early ’80s as Namco’s Pac-Man is ripping up arcades. Band is swift enough to snag rights to all sorts of properties, many for the life of the VHS format. That was the start of Wizard Video, and with the help of the rental market, they became successful. Then, someone brought up the idea of video games. “I think it was ironic. I’m not even a video game person. I don’t want to downplay it, but I love the concept, the visuals, so I followed it vicariously over the years. Back in the day I thought, you know, it seems like people are playing these games. This was the early, early days of video and we were pretty well known as far as our VHS offerings, even with Betamax. But, Band was a film director and producer. His only connection to video games was a source in Silicon Valley, a name which through the years has unfortunately escaped him. Maybe it was for the better given who he was dealing with. Those developers were VVS, Inc., and MicroGraphicImage, both formed by prior employees of Games By Apollo. Both started as the video game industry was beginning to tumble and crash. Like so many start up game companies at the time, their resumes are short. VSS was able to produce nine games, their final release being Band’s Chainsaw Massacre adaptation. MicroGraphicImage only made two, Spelunker and Halloween. Despite not being a gamer himself, Band was still into the development process. He states he made multiple trips to see how things were going and added his own input. However, the simplicity of the technology meant there was only so much he could do. Band’s memory is right. The familiar theme plays almost hypnotically as Michael Meyers chases down a helpless babysitter in Halloween. The three second, screechy theme music loop is enough to drive any player mad, added reason to get away from the stab-happy villain. Players control an unnamed babysitter trying to save children in a two story house. 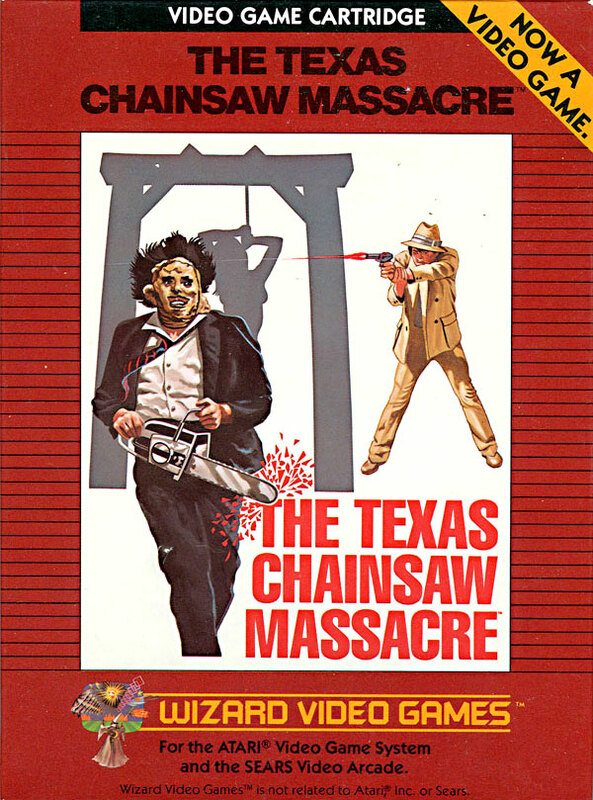 Texas Chainsaw Massacre has the player committing murder while racking up points before the chainsaw runs out of fuel, although it is sans music. A high-pitched beep signals the appearance of a victim, and the weapon groans incessantly. In the world of direct-to-video B-movies, speed is of the essence. In the world of video games, even simplicity takes time. In unfamiliar territory, Band became a mixture of someone wanting to make money on licenses he says he secured cheaply, and someone who just wanted to enjoy the experience. The time spent did not amount to much. Upon release, retailers were unwilling to stock Wizard Video Games’ titles, or did so almost under protest by putting them behind the counter. The growth of video games into a mature market has eroded the line of thinking that video games are toys. 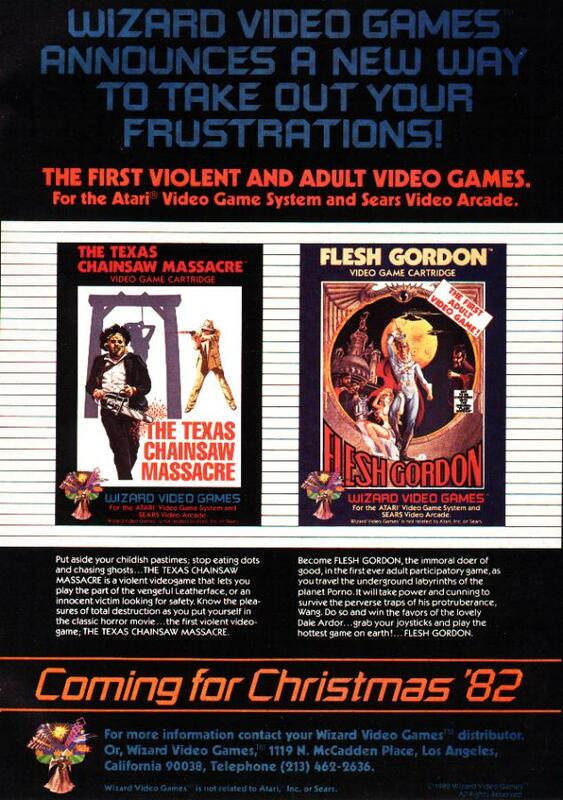 Back then, seeing Leatherface on the cover of a video game in the toy department would be bad for business. Band could not believe the response from the retail sector. “I said you gotta be crazy. First of all, the movie itself is not that violent. People have this idea about Texas Chainsaw which is really a great, beautifully crafted horror film, but not super violent. Today, there are things that are 10 times more violent. Surprisingly, despite the idea that his games were controversial to parents, Band never saw it that way. He was never contacted by the media about these releases, and seemed stunned about the possibility of public outcry. He certainly does not attribute the collapse of Wizard Games to the debate over game violence as is so often stated either. How quickly did they close? Fast enough that remaining Halloween cartridges were released with handwritten titles across the front of the cart. Amongst the collecting community, that still counts as an official release, even though the name is sometimes spelled wrong. The label version is worth slightly more. Like most people trying to recall 40 years of history, the story of that decision will remain legend. Band cannot recall what led to the label-less Halloween scenario. Despite being burned ages ago, Band still sees value in the video game market, and has interest. Like many B-movie kings, it is time that he does not have. Maybe the discovery of boxes and potential revenue will sweeten the deal. As of now, Band is unsure how he will sell the hundred or so found boxes of each title. The conflict comes in as he still wants to be part of the process by autographing the pieces. His VHS find has the community split over those who want pristine packages and those looking for personalization. No doubt video game collectors will be equally concerned. Unlike VHS tapes though which can be easily reproduced from masters in Band’s own collection, the game situation is a little trickier. He has an idea to include a flash drive inside each box with the games ready to play. Therein lie all of the legal and rights issues. “I don’t know if the contracts were for 20 years, 30 years, or perpetuity. A number of my video contracts, thanks to my attorney back in the late ’70s, early ’80s, were in perpetuity. The bummer is when the VHS became obsolete, any of those movies that were on that label like Parasite or Zombie, really don’t mean anything because they don’t market them [VHS tapes] anymore. He has time. While the big VHS boxes for the likes of I Spit on Your Grave and Zombie are for sale now, the game boxes for Wizard’s titles are planned for release at an unspecified date in 2013. Until then, to autograph or not to autograph? Certainly, despite having such a small role in a sea of quick death publishers, Charles Band has enough of a gaming legacy to earn a little face time.